Offering Lifetime Guarantee Protection on Paint, Fabric, Leather and Alloy Wheels. Diamondbrite is only installed through authorized dealers. DIAMONDBRITE IS USED GLOBALLY BY many of the major motor groups throughout Europe, Asia, Russia and the Middle East where the environments are more harsh than anything North America can throw at it !! The Diamondbrite Dealer Premium Pack has six levels of aftersale kits to choose from. 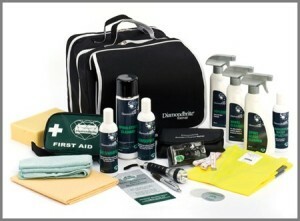 Kits come with everything you need to completely protect the customers new vehicle plus. In addition the kit provides several different cleaners and applicators for the enthusiast who wants to give their new vehicle that extra attention and comes in an attractive carry bag. The kits include products such as Interior fabric cleaner, alloy wheel cleaner, windshield protection, sponges, chamois and much more. Ask your product speacilaist to assist you in choosing the one that best suits your customers. Diamondbrite proved superior to the top two competitors in both the Water bead test and the specular gloss test. The water bead test is a guide to the effectiveness of the paint protection, the higher the bead, the better the protection, Diamondbrite was superior to both. The specular gloss test showed that after 12 months the Diamondbrite was still protecting the finish while the top two competitors were not much better than the untreated panels and in one case actually diminished the protection slightly, once again proving Diamondbrite is the Superior product. Request a FREE product demonstration today! The Best Paint Protection in the Industry gets put to the Ultimate Challenge.